Iris Jackson works with first-graders at Patrick Henry Downtown Academy in St. Louis on a reading comprehension assignment. Jackson is a resident teacher at the school. A group of middle-aged adults is back in school this fall. This time, though, they’re at the front of the classroom learning how to be teachers. 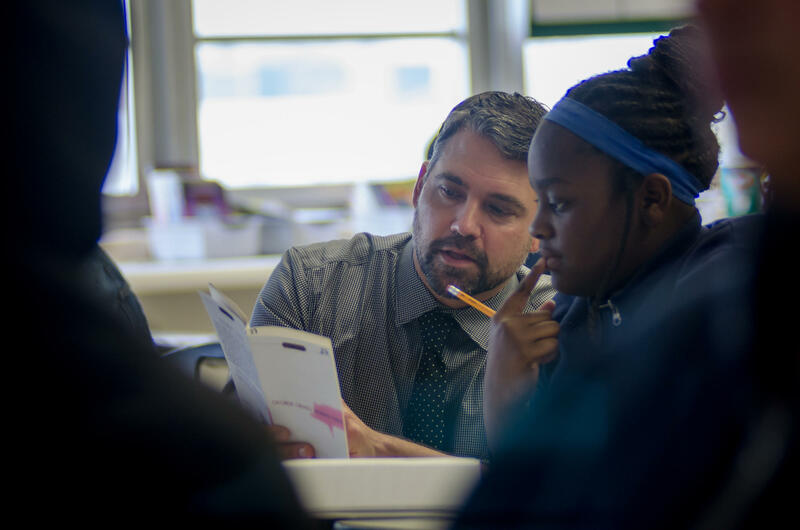 St. Louis Teacher Residency, launched over the summer, is recruiting adults to change careers to work in education, hoping their life experience and maturity will lead to less burnout and longer tenures among urban educators. The new teachers spend four days a week under the mentorship of a senior educator, while also working on a master's degree and teaching certificate. Residency programs like this are becoming an increasingly common way of cultivating teachers in more than two dozen cities, including St. Louis and Kansas City. The educators ease into classroom life, as compared to the well-known Teach for America program, which places recent college graduates in schools for two years after a summer training program. Instead, these teacher residents make a three-year commitment following their year of residency. The residency has 18 fellows for its first year, spread across St. Louis Public Schools and the KIPP charter network. Meet two middle-aged adults who are taking a second try at finding their calling. This time, as first-year teachers. 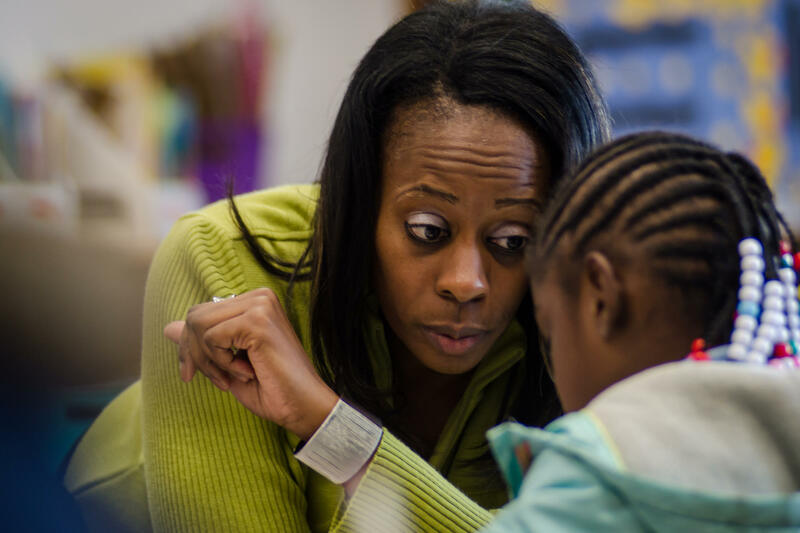 Iris Jackson helps a first-grade student understand an assignment. "When I tell you it's exciting for me, for me it's been a long path for me," Jackson said. Iris Jackson had to learn to lower her voice to work with first-graders instead of teenagers. “A lot of times I use that strong mother voice when sometimes you have to just lower it and actually sit and listen to them,” Jackson, 47, said after stepping out of her classroom at Patrick Henry Downtown Academy. She gleaned that strong mother voice working in a juvenile justice center, where she discovered her favorite part of the job was helping in the classroom. “I was so eager every morning on that shift to work with that teacher to help those students,” she said. Jackson decided to leave juvenile justice and pursue education, first becoming a long-term sub for SLPS and then a reading tutor at Patrick Henry. “That just built up my adrenaline, like okay, I can do this, I want to do more,” she said about helping kids who were behind in reading. The principal encouraged her to apply for the teacher residency program. Jackson uses that softer tone to comfort a pouting kid. She flashes a beaming smile when a student improves his sight word vocabulary by nine words. There are lots of high-fives too. Jackson and the other residents will be placed in classrooms of their own next fall, but not necessarily the school in which they completed their residency. Her fingers are crossed she can stay at Patrick Henry. “Every day I say ‘is this is where I’m supposed to be?’ And then I come and experience something different and it shows me this is where you’re supposed to be,” she said. Jeff Konkel left public relations to become a middle school English teacher. He's a resident at KIPP Inspire Academy and will have his own class next year. There are a few gray hairs on Jeff Konkel’s head and in his trimmed beard. The 44-year-old said he got some confused looks from fellow staff members and even some students when he didn’t quite fit the mold of first-year teachers. “There is no way I could have done this work when I was in my 20s, I just couldn’t have. I don’t think I had the patience, I didn’t have the compassion and empathy that’s required to do this work day in and day out,” he said. Konkel worked in public relations most recently and has a small Mississippi blues music label that he's put on hold in order to pursue teaching. 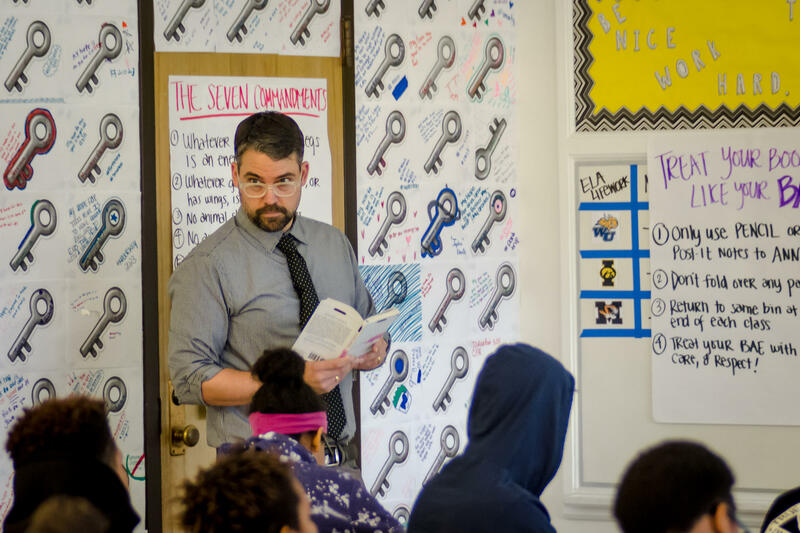 While he's used to speaking in front of crowds, Konkel found standing in front of an English class at KIPP Inspire middle school “terrifying” at first. As a resident, Konkel observes a more experienced teacher. He’ll run a lesson or discussion and then get feedback. Over the course of the school year, he’ll be in charge of the classroom more and more. A few weeks into the school year, Konkel was having a hard time connecting with a student who was also new to KIPP. “I was really doubting myself in that moment,” he said. “I did my best not to cry right there, but it meant a lot,” Konkel said. He keeps the note folded up in his wallet, a reminder of why he’s on this journey to become a teacher. Jeff Konkel said his first time teaching a lesson to middle school students was terrifying but he's had victories with students too.